Now that the Moto X is available with a Bamboo back, we can imagine you have questions. Since this is the first phone that we can think of to feature wood, real wood, you are probably wondering what the phone will look like, how long it’ll take to arrive, if you can exchange your current Moto X for one, and most importantly, if other materials are on the way. In short, the Moto X with Bamboo costs an additional $100 over regular MotoMaker made devices and more than likely will not arrive until January. The Bamboo is indeed real, so no two phones will be alike. There are other materials on the way, however, Motorola has nothing to announce at this time and made no mention of Rosewood, Ebony, and Teak, the other materials we were initially told about during the phone’s August launch. To get the rest of your questions answered, we have included the official Moto X Bamboo FAQ below. How much is Moto X with Bamboo? Ordering Moto X with Bamboo will add an additional $100 to the cost of the phone. Is Moto X with Bamboo real? Yes! 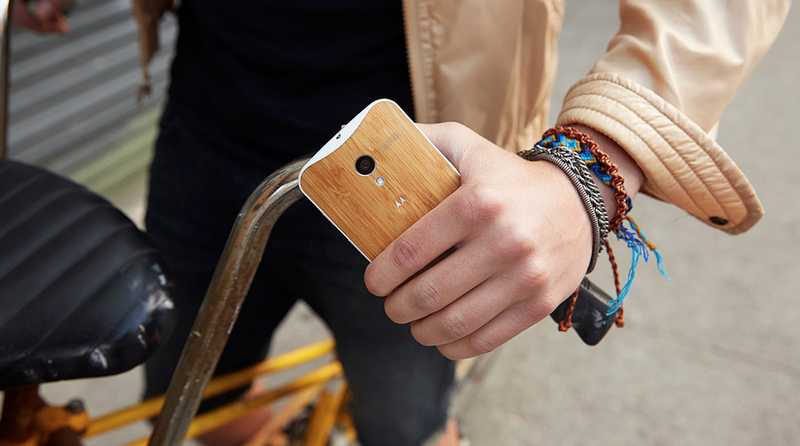 Your Moto X with Bamboo is made of real bamboo, so no two devices will ever be the same—it’s truly a smartphone as unique as you are. Are other unique materials available? At this time we only offer Moto X with Bamboo. Please continue to check our website or look for updates on Twitter. How can I purchase Moto X with Bamboo? Moto X with Bamboo is available exclusively from Motorola at motomaker.com, but initial quantities are limited. When will I get my Moto X with Bamboo? Moto X with Bamboo will not ship until after the holiday season (January). Moto Maker will provide a shipping date estimate when you order. Can I purchase Moto X with Bamboo using a Moto X card or Verizon redemption code? Can I exchange my current customized Moto X for one with a Bamboo back? There’s no such thing as an “exchange” when you’re dealing with items this unique. If your phone falls within our 14 day return period (30 days in California), you can return it for a refund and re-purchase a Moto X with Bamboo. I purchased a Moto X from Moto Maker using the a holiday promotion code. Can I switch it to a Moto X with Bamboo? If your phone falls within our return period, you can return it for a refund of the original purchase price and re-purchase a Moto X with Bamboo. However, the Holiday discount you received will not apply.